We do UV cured flat bed printing on most common sign making materials.We can also do custom cut shapes in Sintra, Gatorboard, and Ultraboard with our CNC router. We are especially proud of our new 50 point board product, which is made from 100% recycled paper and can be recycled with your cardboard. It's the perfect product for in-store 22x28 displays, is 100% green, and allows you to have signage that doesn't go into a landfill. 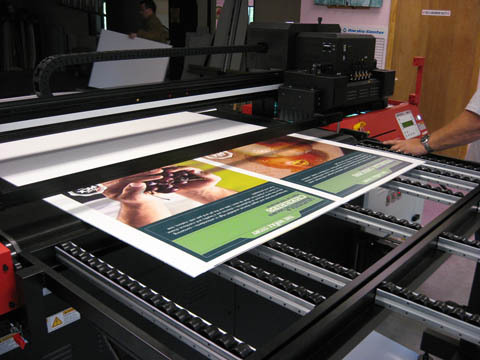 Our equipment can print on just about any substrate up to 1.5" thick. 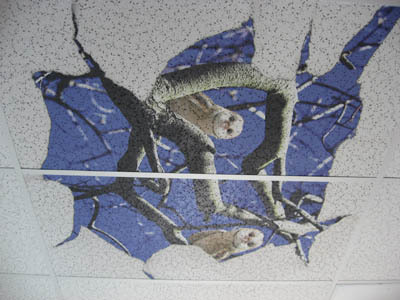 We've also printed on plexiglass, ceiling tiles, tyvek, wallpaper, and acoustic panels, just to name a few. 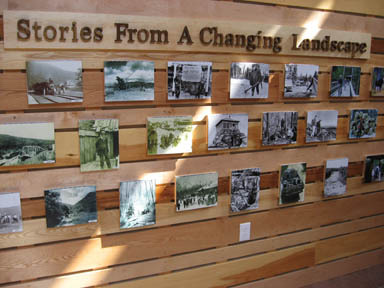 Typically we are doing retail store signage, trade show graphics, and signs for conferences and events. 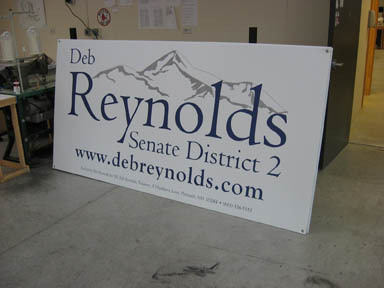 We've also done outdoor signage for trail head kiosks and ski areas, stores, and political campaigns. 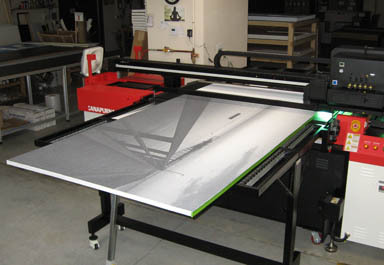 We can produce flat bed printing from all the common graphic design programs. 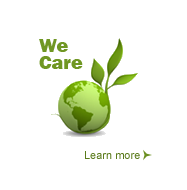 Lead time is about a week for most jobs. "Start to finish, you have satisfied my needs in every way! From the samples you mailed out, sterling customer service, speedy delivery not to mention the PERFECT job and excellent product, I am happy, happy, happy. It was a pleasure doing business with you."